There are few things in this world guaranteed to be as successful as a purported method to lose weight. And, as a result, many different types of treatments, therapies, supplements and even medicines have been developed in order to help battle the bulge and help people shed pounds. Alternative treatments have always been popular in this regard, but interestingly enough, two of the most well known therapies for the management of both chronic and acute pain are also potentially useful in weight loss too. Cryotherapy and acupuncture for weight loss are both becoming more and more popular. However, one has a tremendous amount of potential and results to back it while the other falls a little flat. It’s perhaps not a surprise that acupuncture for weight loss has become popular. After all, the treatment is relatively inexpensive, and many people have success with the ancient Chinese remedy for everything from back pain to helping them quit smoking. The problem with acupuncture for weight loss is that it’s unproven, and the method doesn’t vary regardless of what an individual is being treated for. The treatment centers on the use of thin needles inserted at specific pressure points which are supposed to channel energy in different ways and to different places to both reduce pain and change mental perception. The big problem with using acupuncture for weight loss, however, is that it’s relatively unproven in terms of success and while affordable at around 50 to 100 dollars per session, that can get pretty costly, especially if there are no results. Conversely and unlike the use of acupuncture for weight loss, Whole Body Cryotherapy has been proven in some ways to help users lose weight. Long ago, it was discovered that when the body is cooled that more calories are burned much faster. However, it wasn’t until the past few decades that a method of exposing people to supercooled temperatures without sustaining tissue damage was truly possible. The benefits of cryotherapy in terms of weight loss come from the procedure’s ability to jump start calorie burning processes safely and without internal or external damage. This is done by using liquid nitrogen and only exposing participants for a short (two to three minute) period of time. Aside from calorie burning, there is another way in which cryotherapy beats out acupuncture for weight loss benefits. Until recently, it was thought that “brown fat” was only found in babies, however the rapid energy burning substance has been found in adults as well. This fact is important because cryotherapy provides a way in which to activate this hidden fat, which exists in only a few places throughout the body and is much less abundant than regular and unproductive “white” fat. The brown stuff is activated by cold, and therefore Whole Body Cryotherapy provides the very best means of accessing it. Interestingly enough, another area where cryotherapy beats out acupuncture for weight loss is in terms of side effects and after effects following treatment. Of course, participants may feel chilly following treatment, and some encounter a headache or nausea. 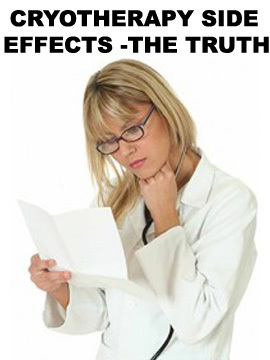 However these effects are rarely reported or long lasting. Conversely, while acupuncture is generally regarded as safe, it can be painful and swelling and bruising can occur following a session. Neither treatment was originally developed to lose weight. Clinics for acupuncture for allergies, pain and stress were around long before any devoted to weight loss. However, today acupuncture is readily available for a wide range of conditions and benefits, although it’s most often hailed for relieving pain in the lower back, and acupuncture for arthritis pain relief is also very common. Cryotherapy is also most predominantly used in the management of both acute and chronic pain, and it’s very popular with athletes who find it helps speed recovery after injury or an intense physical activity. However, the cool therapy was originally created as a natural means of rheumatoid arthritis treatment, an endeavor it’s known as being rather successful at. Both treatments boast a wide range of other applications that those using the treatment for weight loss can benefit from, mostly involving pain relief; however, again, the difference is in documented results, and cryotherapy has them. 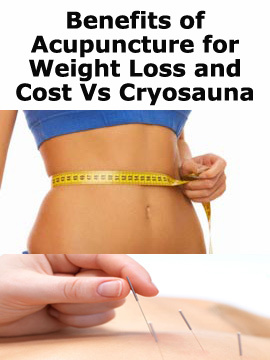 It may be easy to select acupuncture for weight loss over cryotherapy in one area, and that is cost. However, this perception is wrong again. It’s true that acupuncture is affordable, with some sessions costing as little as fifty dollars. 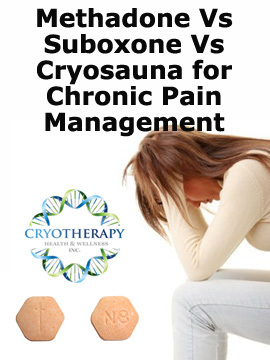 However, the cost of cryotherapy is nearly identical, with it’s high end being the same as acupuncture at around one hundred dollars per session. Perhaps this is why Cryotherapy Toronto based clinics are becoming more and more popular. In addition to the hype surrounding the method’s numerous benefits, it’s very affordable price point makes it even more appealing. Can Cryosauna help you lose weight? Yes! Contact us for a FREE consultation! Know which package is right for you? Both cryotherapy and acupuncture for weight loss are considered alternative types of treatment. However, only one is supported by different types of scientific research and provides other proven health benefits as well including pain reduction and a rejuvenated sensation. Regardless of which type of treatment you are considering, it’s very important to remember the most common sense and important tips for losing weight: exercise and diet are important to any treatment to be successful and keep the body healthy and happy.